Those of us who love animals have all experienced the sense of grief and loss when one of our beloved bunny friends dies. 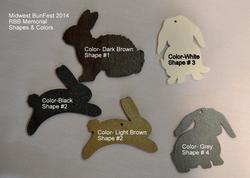 Midwest BunFest and the Ohio House Rabbit Rescue will , once again, have the memorial wall at this years event, where those who wish to, may purchase a wooden bunny ornament in memory of a pet who has crossed the Rainbow Bridge. We believe that the best memorial we can offer to our departed friends is to extend our love and compassion to those bunnies still here on earth , who need homes, love and proper care. In this spirit we offer this Rainbow Bridge Memorial Wall at Midwest BunFest. A wall size painting will be prominently displayed on the main conference floor, where you may attach your memorial ornament for display. All proceeds from the sale of the ornaments will go to the care and feeding of rescue bunnies at the Ohio House Rabbit Rescue Adoption Center. At the conclusion of Midwest BunFest, the wall will be relocated and prominently displayed at the Ohio House Rabbit Rescue Adoption Center for the rest of the year. Those who wish to leave their bunny ornament with the wall will have it moved at that time and displayed at the center. Those that want to take their ornament home can pick it up at the end of the day. Ornaments are available in white, black, grey, light brown and dark brown for a donation of $5.00 or more, each. We have 2 styles of "up-eared" bunnies and 2 styles of "lop-eared" bunnies to choose from. Permanent markers will be available at our Rainbow Bridge Memorial Wall table where you may personalize your ornament.